ProAm Auto Accessories opened in 1984 as an extension of the owner's passion for performance cars and club racing. Our original mission was to provide world class products for sports cars, European sedans, and American muscle cars to our local Houston area enthusiasts. ProAm became known as "THE" place to go to find exclusive and hard to find parts and accessories. ProAm was one of the very first distributors in the USA for brands such as Recaro, PIAA, Koni, Redline, Momo, Corbeau, and Simpson, just to name a few. ProAm is located in the heart of Houston's premier retail and service sector, the Galleria Area. Richmond Avenue, known as "the Richmond strip" locally, is the place to cruise Houston's import cars, and muscle cars. Our facilities include a 8000 sq.ft. warehouse, showroom, and installation bays. We not only sell parts and accessories, but also offer installation and set-up advice. And of course, ProAm is a great place to come and bench race! 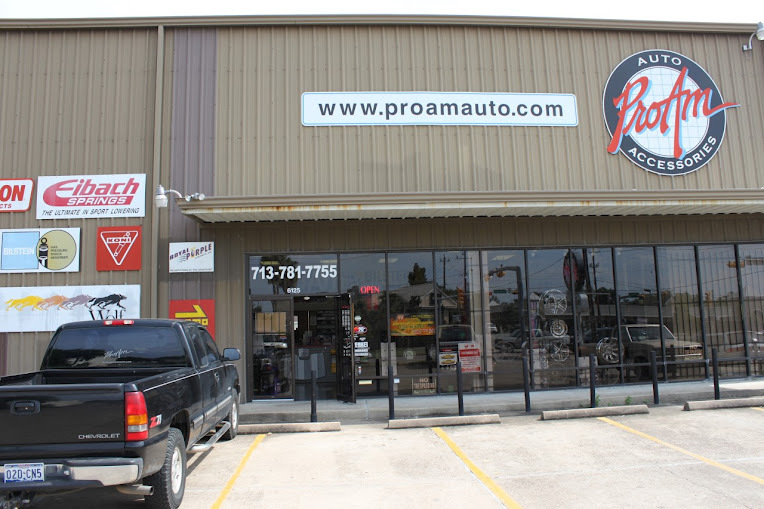 Since creating our website in 1997, www.proamauto.com, has taken our "local" reputation to the rest of the world. ProAm now eagerly helps supply customers with the same high quality and knowledgeable service no matter where they are. We provide friendly, honest service to all our customers. Whether you call our toll free number, send us an email, purchase from our secure online shopping cart, or come by our showroom - you are dealing with a small group of professionals who truly want to help you with your automotive needs. If you don't see what you are looking for on our website, please call us and we will do our very best to help you.